The campaign to conserve Alswell Farm is off to a good start — but we have little time left! Because the enhanced federal income tax incentive for conservation easement gifts will expire on December 31, our opportunity is only viable if we act quickly. With just over two weeks left, we still have $35,000 to raise! The conservation easement we have crafted with landowner Ed Chamberlain will protect the fields, woods and wetlands at Alswell Farm. 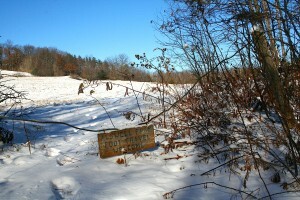 Ed wishes that the public will continue to be able to ski, snowshoe and hike on much of the property as he has welcomed during his ownership. The area closer to the home and barn will not be open for public use, so that landowner privacy and agricultural uses can be maintained comfortably. Perhaps Ed’s daughter will take on care of the land and home at some point, but regardless of who owns the property forever in the future, the fields, woods and wetlands will be protected against development, subdivision, mining and commercial uses. People who want to help can make gifts of cash or stock (with the market gains this year, this is an increasingly attractive option for donors who might otherwise pay capital gains). We can also accept pledges of gifts in 2014 and 2015. 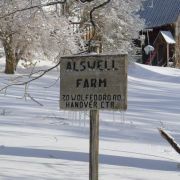 Please help us conserve Alswell Farm. To make a secure online gift, please click here. For a downloadable pledge form, please click here. Print the form and fill in the description of the gift(s) you plan to make. Mail the form to UVLT, 19 Buck Road, Hanover, NH 03755. Please contact me if you’d like account instructions to transfer stock. And, of course, I am happy to answer any questions about the project.